Our stuffed huskies and plush huskies are great for those three dog nights...you know, when its so cold that you need three dogs in bed with you to keep warm! My guess is that one husky stuffed animal will do the trick for most people but if you need three, or three hundred, we can help you out. 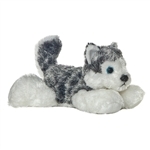 A plush husky makes a great gift for a student heading off to the University of Connecticut or maybe Northern Illinois University, both of which have the Husky as their mascot. We have small stuffed huskies, like Wuskee the Plush Husky by Aurora, large plush huskies, like Nadia the Plush Husky by Douglas, and even a lifelike husky by Hansa. Some of our husky stuffed animals are lying down, some are sitting, and some are standing up so no matter how you intend to use your stuffed husky we should be able to meet your needs. If you're assembling a team for the Iditarod then this great variety of stuffed huskies should get you on your way. Just remember, a stuffed husky is not quite as fast as a real one so you'll need to get a head start on the other sled teams if you want your stuffed sled dog team to be competitive!